A key part of marketing in hospitality, multifamily or entertainment is all about visuals. Choosing the right kind of visuals is half the battle. 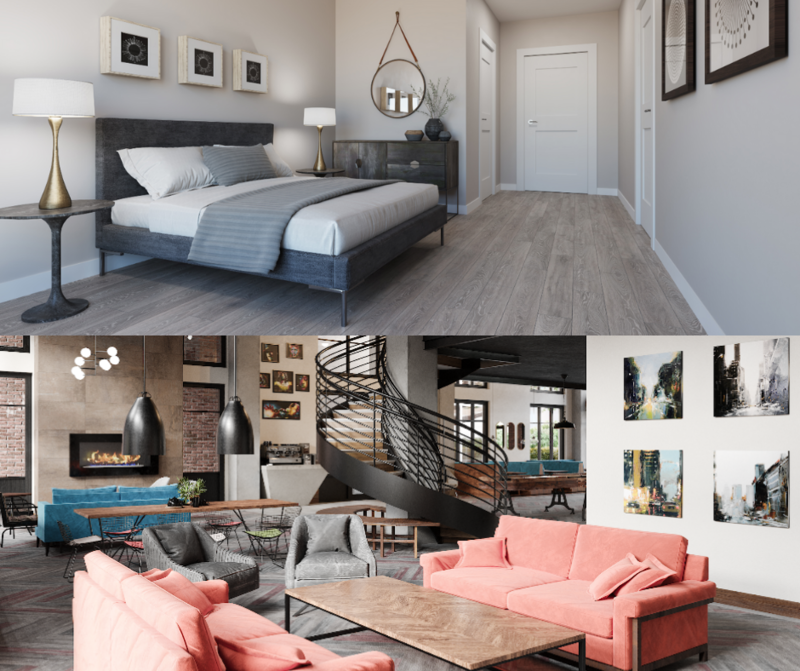 In many industries, developers and marketers team together to decide between 3D renderings, virtual staging or professional photography to best showcase a space. And most often, developers may find themselves in a tangle between working with a 3D rendering company or sticking with photography once a project is complete. As a project manager or developer, you may be considering your options for a new building, high rise or redesign. Whatever the case, both 3D renderings and photography offer a myriad of unique benefits with their own use cases. No retouching necessary. 3D renderings are whatever your want to make them. You won’t have any unwanted objects in the way to remove post-production. No more lighting challenges. 3D doesn’t present the same weather or lighting challenges. There is no time wasted creating 3D renderings in this case. Edits are much more flexible. When a photo shoot is done, it’s done. But with 3D renderings, you have the option change angles or retouch as needed. Speed up production time. As you might expect with all the items listed above, 3D architects can get to work on your renderings much quicker, whereas photo shoots must be scheduled and have post-production steps. Increase pre-leases, bookings and initial marketing efforts. And the final key benefit of 3D renderings that tops them all is that they’re powerful marketing tools. When a property is in development, it’s difficult to show off the space, but realistic 3D images give future clients a look at your project prior to its completion. Photography is honest. That’s not to say 3D rendered images cannot be honest, but photography captures everything that is really there. Sure, editors can always retouch your photos to eliminate unwanted objects, but photos will give viewers a look at the real thing. Photography is ideal for completed projects. If you’re not in the development stages of your building, it’s likely you’ll opt for photography. As stated above, this will give your viewers a truly authentic look at your property. Capture multiple versions of your space. Photography makes it easy to capture multiple, authentic versions of your space, whether that’s seasonal, nighttime, or dusk images. Photography offers in-person collaboration. While you would work long-term with a 3D artist and your construction team to create realistic 3D renderings, a photographer is on-site. This can allow a much more authentic and personable approach to the work created. Convinced of which is best for your project? Ultimately, that depends on your goals, how you plan to use the content, and production time. Let’s take this a step further and examine these products up close to get a better feel. Let’s Play a Game: Real or Rendered? The truth is, 3D rendering technology has become so advanced today, that it can be quite difficult to pick out a 3D rendering from a pile of actual photographs. Shadows, lighting, furniture and every little detail in a 3D rendered image can look just as real as… well, the real thing. So, let’s put it to the test. Let’s see if you can choose which photo below is rendered, and which is real. The point here is that these images look so real and stunning to the naked eye, that more and more project managers and developers are opting for 3D renderings regardless of the stage of their project. And the results are just as impressive as the 3D models you see above. Thinking about visual marketing solutions for your next project? Contact us today to start creating amazing visual content.